Teaser Tuesday: What was childhood like in an Anglo-American garrison? 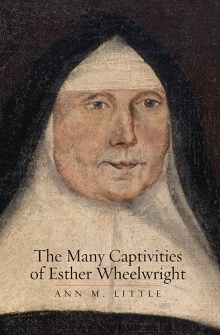 It’s back–Teaser Tuesday, in which I offer you a little flava of what you might find in my book, The Many Captivities of Esther Wheelwright. Today I give you a little hint from chapter one, in which I write about Esther’s life from birth up to age seven, when she’s taken captive in a Wabanaki raid on her hometown of Wells, Maine. One of the most exciting developments in history lately is the emergence of age as a category of analysis. I had a lot of fun thinking about the ways in which age might have shaped Esther’s experience of the different worlds in which she lived–in an Anglo-American frontier town, in Wabanaki mission towns, and then in Québec as a student in the Ursuline convent school, where she then remained as a nun for the rest of her life. Lots more, and even a very creepy doll, after the jump! Bangwell Putt rag doll, ca. 1765-75, in the collection of Memorial Hall, Pocumtuck Valley Memorial Association, Deerfield, Mass. After she helped the grown women with the breakfast dishes and tidying the hall, most mornings Esther may have stolen a few moments to play with her younger siblings, and perhaps some neighbor children. At seven, her labor wasn’t nearly as helpful or as necessary to her mother as that of her elder sister, who perhaps had to stay closer to home to help Mary Wheelwright and the other women in the household with some late-summer tasks like tending the garden, food preservation, or perhaps laundry before the chill of autumn would make that chore more arduous than it already was. If she was at liberty, she may have played marbles with the younger children, or with a toy called a “whizzer,” a notched disc strung on a loop that made noise when the string was pulled to make the disc spin quickly. Jew’s harps were also common in early New England, so she may have learned to play one from her older siblings, or perhaps from a guest in the family tavern. She may also have had a doll—homemade out of cloth, or a poppet carved of wood, and perhaps shared with her sisters. Then again, seven was of an age when she might have been expected to spend some time learning to read, with her mother’s or older sister Hannah’s assistance. Because Puritans were Protestants who emphasized the necessity for all believers to read the Word of God for themselves, both girls and boys were taught to read in early New England, usually at home or in privately run “dame schools,” akin to modern nursery schools or kindergartens, whose main function was teaching reading. But even in her opportunities for education, Esther’s world was restricted. Only boys were taught to write, and this precious skill was taught in boys-only Latin grammar schools, which were intended to train boys in skills they would need in college instruction, or in less ambitious reading-writing schools that for the most part admitted only boys. (This latter schooling is probably all that was available to Esther’s brothers in Wells around 1700.) In truth, most boys received only the equivalent of a few years of elementary school education, so that they could attain some basic reading, writing, and arithmetic skills, and only elite boys were permitted to undertake advanced study in Greek and Latin in the grammar schools. Girls (and women) were permitted to be passive consumers of knowledge as readers, but through the seventeenth century and well into the eighteenth, they were not permitted to generate new knowledge as writers. This separation of reading and writing skills, and of girl and boy students, was beginning to change around the turn of the eighteenth century, although it’s highly unlikely that Esther Wheelwright and her sisters would have benefited from the beginnings of this transition to full female literacy education. In any case, at the time she was taken captive at age seven, she was only just old enough to hold a quill pen. Her first instruction in reading would probably have come at her mother’s knees, as she leaned in to see the hornbook that Hannah held. The hornbook was a tiny wooden paddle with a handle that held a piece of paper secured under a translucent sheet of horn—a primitive experiment in lamination, about three inches wide and four inches high. In addition to an alphabet and a basic syllabary (an early exploration of phonics, with nonsense syllables like “ab eb ib ob ub/ba be bi bo bu), the hornbook commonly included a copy of the Lord’s Prayer. Simple, durable, and inexpensive (about one penny apiece if “gilt,” half a penny if “plain” in 1700), they were the primary bearers of literacy skills in early New England. Girls like Hannah and Esther may have spent an hour or so reading in the morning after their chores, but at seven and nine they would have probably moved beyond hornbooks. They were at prime ages for somewhat more ideological reading material, such as inexpensively produced didactic primers or catechisms, which were thick on the ground in early New England. Catechisms were written as a dialogue between an adult instructor and a child that emphasized obedience to authority and fealty to Protestant Christianity. In the rhythm and content of the rote questions and responses, they reminded Puritan children of the limits they needed to live within, because there was only one right answer to each of these questions. About that creepy doll, Bangwell Putt: I’m sure she was lovely when she was first made, but like most rag dolls, she was clearly loved nearly to death, which is why so few survive in museum collections (or even in private hands). There’s a fascinating back story to Bangwell Putt, which I couldn’t include in my caption for the high-resolution photo I included of her in my book on p. 33. Dolls could be purchased, but many people made them at home. 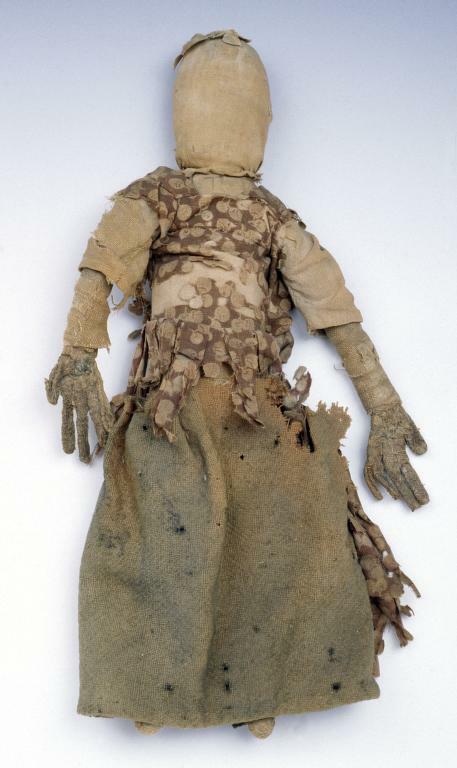 A relative made this rag doll for Clarissa Field of Northfield, Massachusetts, around 1770. She named her Bangwell Putt. (Clarissa had several other dolls, all with equally fanciful names, including Pingo, Palica, Kimonarro, and Ebby Puttence.) Clarissa Field was born blind. Although Bangwell Putt lacks a face, her ten fingers were carefully made, suggesting the importance of touch in Clarissa’s world. Like other little girls, Clarissa could use her doll to practice the skills she would need as an adult. She could dress and undress Bangwell, and sew fashionable clothes for her. Bangwell has a homespun body and is dressed in eighteenth-century fashion, including a corset. Clarissa also could tend Bangwell as a mother would a child. Clarissa never married. She kept Bangwell until she died in her eighties. Bangwell Putt is thought to be the oldest surviving rag doll in North America. I was sorry I couldn’t include more of that information in my book, but it just wasn’t germaine to my use of the object (and my editor brutally slashed my prolix captions down to the bone!) But I’m thrilled that I can share with you the story of Clarissa Field and her lifelong companion here. She’s another one of the eighteenth-century girls and women whose lives I also hope to illuminate in my book, along with Esther Wheelwright. The book sounds absolutely wonderful. And thank you for including the information about the rag doll! It was lovely to think about her getting so much enjoyment out of the doll’s tactile aspects. She was clearly also very aurally sensitive based on those terrific names. Thanks! Great point about Field & aural sensitivity. The Bangwell Putt doll would be a great opportunity to write an object-centered article on disability in early America. The doll is fascinating! What an interesting story! Sounds like a super book! Good work! Thanks! Next week: what’s for breakfast in early New England? re captions and stuff, being edited is a kind of captivity of its own making and degree, isn’t it? Imagine if your editor carried you across a big river, and traded you to another house for a proofreader, an intellectual property lawyer, and a year’s supply of red ink! I jumped on the word “poppet” the first time I laid eyes on this material. It never even occurred to me to think that it channeled the word “puppet,” I just thought it was one of those great uses of the lingual humanities by those colonials that make you glad to be eligible to make up words when you need to. I actually had to google it. I’m now armed with my own actual copy of this work, and am enjoying every minute of it! I really enjoyed your information about childhood and the doll. I had previously researched about dolls for my novel and discovered poppets too. So fun to see the image of the rag doll. Keep writing! I rarely buy academic history books, because of the high prices (not blaming the authors! or even the publishers, because I realize that publishing anything that is not mass-market is just really, really expensive). But I’ve just ordered a copy of The Many Captivities, can’t wait to receive it. I resisted the temptation to get the Kindle version, because I know this is a work that I’m going to want to experience and enjoy as an actual, physical book.